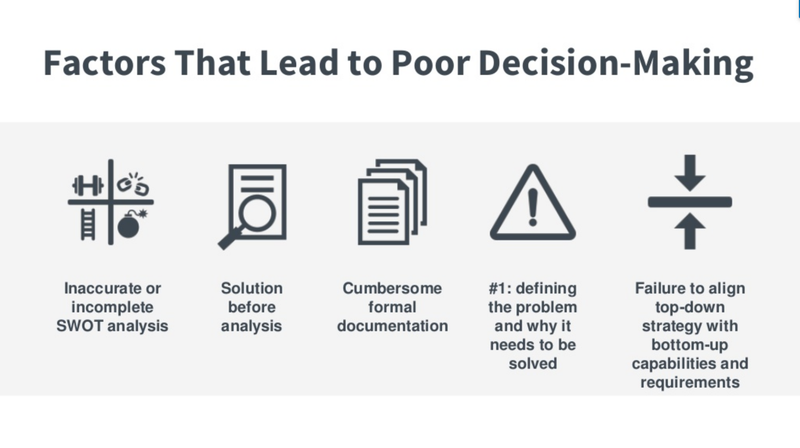 Businesses are required to make hundreds of decisions in an effort to meet their goals, but if you miss critical elements of the decision-making process, you may choose poorly... and experience failed projects and major losses. Steven Hodnett, business analyst for 10 years and former president of the IIBA Salt Lake City chapter, joined us for a webinar where he shared the critical elements for better decision-making and ways to incorporate diagrams into your decision-making framework. We’ve got a recap of his thoughts—along with some templates to help you apply these tips now. Think about all the factors you’d consider before you buy a home: the cost, the number of rooms you need, the size and age of the property, the quality of the neighborhood, the schools nearby. The home you ultimately choose should align with your other priorities (e.g. finding a location close to your job or having enough rooms for your growing family). Steve discussed Chris Outram’s 10 pitfalls of strategic failure (many that involve a failure to communicate strategy to or install a sense of purpose in the teams that need to execute), but he also explained his own factors that could lead to poor business decisions. A SWOT analysis asks you to consider the strengths, weaknesses, opportunities, and threats involved with any decision. Many professionals only apply the SWOT analysis to the company when they should use it over multiple levels of the organization (including your market, your product/service, customer outreach, business operations, and even vendors and partners you’re considering). As an analyst, Steve has seen many companies implement solutions before they have fully analyzed their options. Remember—analysis is a process, and you can’t skip steps. Formal documentation can seriously hamper your decision-making ability. Say you’re collecting data to include in a lengthy presentation for an executive committee. If it takes you several months to compile all this information, the data could be outdated by the time you present, or the most significant or influential findings from your research could get lost in the sea of information. Although #4 on this list, the greatest challenge that Steve has seen from businesses seeking a solution to a problem is a failure to define the business problem at all. In these instances, the solution becomes the answer (e.g. this software is highly rated, so we’ll solve our problems if we install it). Instead, companies should focus more on the problem and constantly monitor and work to solve it. C-level executives often feel pressure to come up with a top-down strategy that resolves a business issue. However, these leaders on their own may not be best equipped to decide on a solution. Businesses need to dig in to understand their existing resources (including employees, tools, and software) and, from the bottom up, evaluate the specific gaps that are causing issues or the resources that they aren’t getting the most value out of. If all the factors mentioned above lead to poor decisions, what should you be doing instead? You employ better decision-making tools. A 2017 Gallup poll determined that only 33% of employees are engaged—meaning 67% of employees have untapped ideas, input, and goals. If you switch from lengthy, formalized business plans to more accessible, collaborative tools, you can get more people involved in the process by incorporating their opinions and analyses. Diagrams provide a great way for everyone to contribute because they remove the “language barrier” between different functional groups and levels of hierarchy. Steve prefers Lucidchart because organizations can build a framework for better decision-making and coordinate strategy with execution. He described many agile tools that teams can use together in real time within Lucidchart to make more effective decisions. 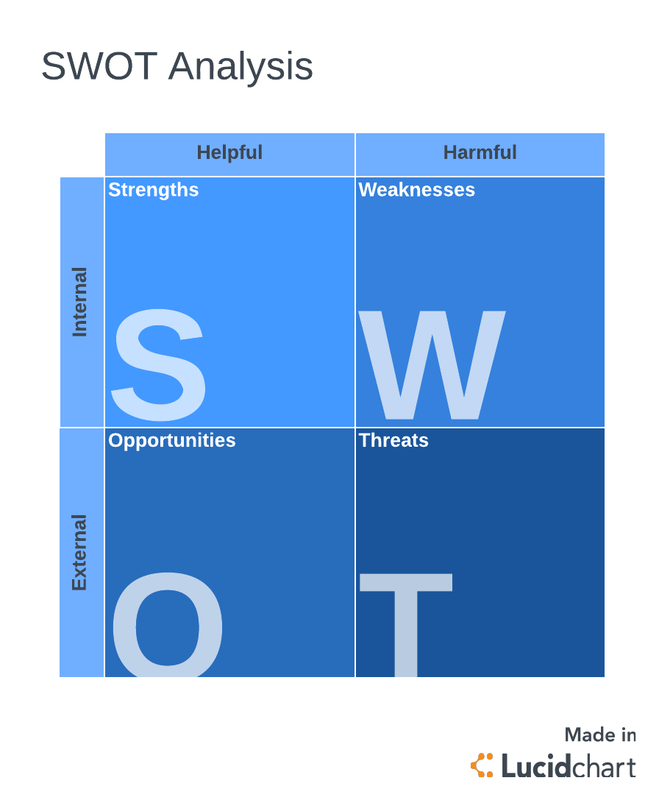 As mentioned previously, you can apply SWOT analysis at multiple levels of your organization to determine your business’s (or your competitors’) strengths, weaknesses, opportunities, and threats. 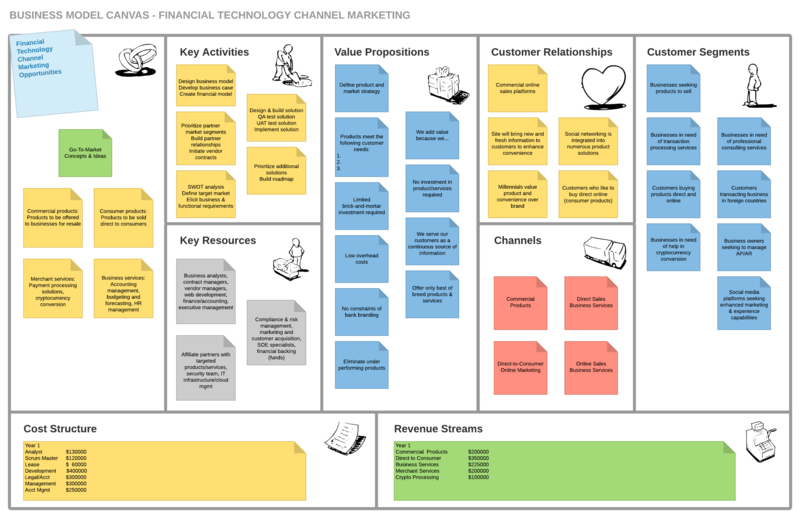 Your company can also turn to this classic method for business analysis: the business model canvas. Consider your value propositions, your market, your customer segments, and the type of relationship you have with customers (consulting, providing the best price, etc.). When you build out your business model canvas in Lucidchart, you can put key concepts and ideas into sticky notes and move them around as you connect those thoughts. 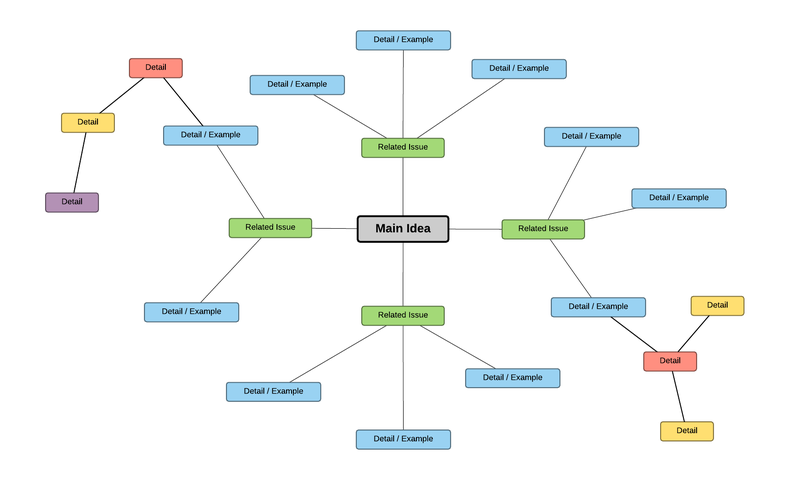 With mind maps, you can start with an idea or concept in the center and develop that idea multiple layers out. Steve mentioned that Lucidchart has been a particularly great platform for mind mapping, as opposed to whiteboards, because he can see the relationship between each item as he goes more in depth. Check out the webinar to see what else Steve keeps in his “diagram toolbox” and then choose any of our Lucidchart templates to start applying these methods of analysis to your company. Whatever method you choose, don’t complete your analysis one time and think you’re good to go. Especially in the tech industry, strategy can change all the time, and these methods will keep your organization focused on the problem you need to solve and why you need to solve it. For a more in-depth look at these decision-making methods, watch Steven Hodnett’s complete presentation on demand, or get started today when you sign up for your free Lucidchart account. 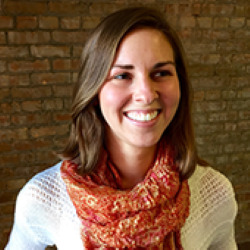 Polly Phillips is a product marketer who helps users get the most value out of Lucidchart. During her time in FP&A, she specialized in increasing the efficiency of her own processes, as well as cross-functional processes. Now, as a product marketing manager for Lucidchart, she's sympathetic to the pain points of our operations users and works to make Lucidchart ease those pains related to creating and optimizing processes. Polly is also a crazy dog mom who has a painting of her dog's head on Frida Kahlo's body (because Frida is her spirit human).